“In 1855 the Merritt family arrived in Minnesota, where a descendant, Alfred, would one day become one of the “Seven Iron Men”—builders of the first mines to tap the state’s great mineral wealth in the Mesabi Range. Another Merritt, more than half a century later, would lead the efforts to protect Lake Superior from damage caused by mining. Iron and Water is Grant J. Merritt’s memoir of his life’s work on behalf of Minnesota’s people and environment and also the story of a significant family in state history. Merritt’s family played a key role in the struggle over natural resources in Minnesota—for the enrichment of mining pioneers, the prosperity of the state and its people, and the prospect of a secure and healthy future. This complex tale begins with the adventure of discovering iron ore and building the mines, railroads, and docks to move it, then devolves into the intrigues of business partnerships gone bad and attempts by John D. Rockefeller to defraud the Merritts. What follows is an engrossing account of Grant Merritt’s years in the halls of state politics and the trenches of environmental activism in defense of Minnesota’s North Shore and Lake Superior’s waters. The author’s tenure as head of the Minnesota Pollution Control Agency under Governor Wendell Anderson and his service on the first board of the Minnesota Environmental Quality Council take us behind the scenes of landmark legal cases and crucial moments in Minnesota history—particularly the notable Reserve Mining case, in which the company was found liable for serious environmental and health threats on the shores of Lake Superior and ordered to be shut down. In these pages we encounter the people who were critical to this history, from robber baron Rockefeller to judges, activists, and politicians, including Walter Mondale and Jim Oberstar. 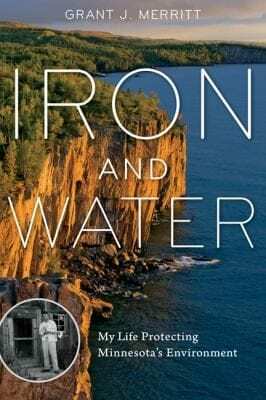 In chronicling both the discovery of vast iron deposits on the Mesabi Range and the fight to save Lake Superior and Minnesota’s natural riches, Iron and Water reveals how, whether alone or together, individuals wield the power to change the world.”–Amazon.com.